The Iowa Hawkeyes have had ten Heisman Trophy finalists over the years. This week we’ve looked back on Iowa’s only Heisman Trophy winner, Nile Kinnick, as well as the four Hawkeyes (Alex Karras, Randy Duncan, Chuck Long, and Brad Banks) who came in second in the voting for the award. Iowa’s four Heisman Trophy runner ups put them second in the nation (behind Oklahoma) in the number of guys who have finished just short of winning the award. Interestingly enough, while Iowa has had one player finish first and four others place second, no Hawkeye has ever finished third, fourth, or fifth in the Heisman voting. If you take out the five Hawkeye players who either won or came in second, the highest any Hawkeye has placed in the Heisman voting is sixth! Today, we take a look at Iowa’s other five Heisman Trophy finalists. Each of these five Hawkeyes goes down in history as one of the greatest players the school has ever had. I wrote about Cal Jones in depth a few months back. Cal was a first team All-American in all three of his years of varsity competition, the only three-time first team All-American in Hawkeye history. As a junior in 1954, Jones became the first college football player, and the first African-American, ever featured on the cover of Sports Illustrated magazine. His senior season in 1955 started off with a bang. 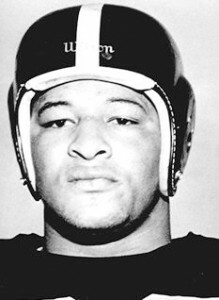 Cal Jones was named as Iowa’s team captain, which was a significant recognition for an African-American at that time. By the end of the year, his outstanding play allowed him to capture the 1955 Outland Trophy as the nation’s top lineman, becoming the first African-American to win the prestigious award. He also finished tenth in the Heisman Trophy balloting, which was won by Ohio State’s Hopalong Cassidy. Interestingly, Jones finished behind two linemen in the voting – Maryland center Bob Pellegrini and Oklahoma guard Bo Bolinger. Jones placed fourth in the voting in the Midwest region, behind Cassidy, Michigan State quarterback Earl Morrall, and TCU halfback Jim Swink. Still, a tenth place finish overall was very respectable for a lineman, especially an African-American one. No black player would claim the Heisman until Ernie Davis in 1961. While Jones wasn’t the first African-American to be named a Heisman finalist (the magnificent Johnny Bright, a halfback from Drake – yes, Drake – placed fifth in the voting in 1951), finishing tenth in the race was a fine finish for an African-American in that era, particularly one who played on the line. Cal Jones was the first Hawkeye to finish as a Heisman Trophy finalist since Kinnick won the award in 1939. Cal Jones also started an unprecedented run of four Hawkeyes placing in the top ten in the Heisman voting for four straight years. Following Jones and preceding runner up finishes by Karras and Duncan in 1957-58 was Ken Ploen in 1956. What can you say about Ploen? The star quarterback from Clinton patiently waited his turn behind Jerry Reichow for two seasons before earning a starting spot as a senior in 1956. Ploen made the most of it, guiding the Hawks to a 9-1 record and their first Big Ten title in 35 years. Iowa went on to win their first Rose Bowl in school history in 1957, and Ploen was named the game’s MVP. Forty years later, the Rose Bowl inducted him into the Rose Bowl Hall of Fame. Heisman Trophy voting is a quirky thing sometimes. 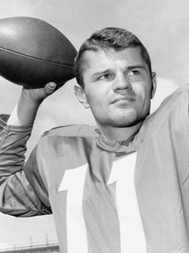 Despite winning the Big Ten’s MVP award, Ploen finished ninth in the Heisman Trophy balloting…behind two other Big Ten players, Ron Kramer of Michigan and Jim Parker of Ohio State. This was the laughable year when Notre Dame bias peaked with the election of Paul Hornung as the 1956 Heisman Trophy winner. The Irish quarterback led Notre Dame to a sparkling 2-8 record, including two of the most lopsided beatings in Notre Dame history. Oklahoma skunked the Irish in South Bend, 40-0, and four weeks later, Iowa matched that margin of victory by posting a 48-8 win. Now why consider giving the Heisman to the quarterback of the team that won by 40 when you can give it to the guy whose team just lost by 40? Hornung was a solid player and all, but to even suggest he had the best year of any player in college football in 1956 is just lunacy. I’m not suggesting Ploen should have won it, necessarily. Johnny Majors of Tennessee, who finished second, had a great year, while coming in fifth was some running back at Syracuse named Jim Brown; he’d prove to be a pretty fair athlete in pro football. But Ploen should have finished a lot higher than ninth and a heck of a lot higher than Paul Hornung. But such is life! 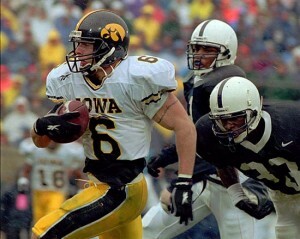 Now here’s the most overlooked Hawkeye Heisman Trophy finalist ever! If you listen to a Hawkeye football game on the radio, it’s easy to forget just how good of a football player Ed Podolak was. It’s easy to fixate on the broadcaster half of this athlete-turned-broadcaster. But you better believe that Podolak was a heck of a football player in his day. Ed Podolak was a talented dual-threat quarterback who dazzled Hawkeye fans with his skills, even if it didn’t lead to all that many wins. In his senior season in 1968, Podolak shifted gears. Podolak’s backup at quarterback, Larry Lawrence, was showing promise, but Iowa’s running back corps was depleted. Since Podolak was such a multi-faceted athlete, Coach Ray Nagel decided to start Lawrence at quarterback and move Podolak over to running back. The result was an offensive explosion seldom seen in Iowa history! Podolak’s shining moment come on November 9, 1968. In a 68-34 victory over Northwestern, Podolak set the Big Ten record with 286 yards rushing. But the truly amazing part of his accomplishment was that he did it on only 17 carries, which seems impossible. It means he averaged nearly 17 yards per carry on his way to the Big Ten record books. The entire 1968 season was a shining light in the dark era of Iowa football during the 1960s and ’70s. But now here’s the little known part of the story: Ed Podolak finished the year 12th in the Heisman Trophy voting. Few Hawk fans know that, because most sources only recite the top ten finalists in any given year. But Podolak’s 12th place finish was well-deserved for all he did to lift Iowa’s struggling program, and it was Iowa’s first Heisman Trophy finalist in a decade. Iowa wouldn’t have another Heisman finalist until Chuck Long placed seventh in 1984, so Podolak was a true oasis in a deserted time for Hawkeye football. I had the opportunity to profile Tim Dwight as the first player featured in my new series on Hawkeyes Revisited. Dwight had an amazing career for the Hawks, setting the school record for career receiving yards and receiving touchdowns and setting the Big Ten record for career punt return touchdowns. He was a legitimate Heisman Trophy contender before his senior season, but a poor 7-5 record in 1997 doomed his chances of landing the trophy. In truth, it was a bad year to go the conventional route as far as Dwight’s position was concerned. Michigan cornerback Charles Woodson upset the presumptive Heisman Trophy favorite, Tennessee quarterback Peyton Manning, to become the only primarily defensive player to win the award. Maybe if Hayden had listed Dwight as a safety instead of a running back he would have placed higher. Who knows? That takes us to Iowa’s most recent Heisman Trophy finalist, Shonn Greene in 2008. Greene played sparingly for the Hawks in 2005 and 2006, and it looked as though his Hawkeye career was over when he left Iowa after his sophomore year due to academic deficiencies. But after a year at local Kirkwood Community College, Greene improved his grades enough to re-enter the university and rejoin the Hawkeye football team. His 2008 season was nothing short of dominating. Although he played sparingly in some of the earlier games in the season while he rounded into game shape, Greene still cranked out over 100 yards every game in limited minutes. By the time the conference season hit, Greene was at his athletic peak, and the results were apparent. Even though every team on the schedule made it a point to try and stop Greene’s streak of 100+ yard games, he just kept running over opponents, week after week. Most thought that the #2-ranked Penn State Nittany Lions would be able to slow Greene, but he topped the century mark against them as well and helped lead Iowa to an upset victory in the process. He carried that momentum all the way through the regular season and into the 2009 Outback Bowl, where he guided the Hawkeyes to their first bowl victory in four years. Greene rushed for 1,850 yards and 20 touchdowns on the year while racking up 13 straight 100+ yard games. For his work on the season, he was named a unanimous first team All-American in 2008 and became the first Hawkeye to claim the Doak Walker Award, which goes to the nation’s top running back. I’ll always maintain that Shonn Greene was hosed in the 2008 Heisman Trophy balloting. He finished sixth in the voting, well behind quarterbacks Sam Bradford, Colt McCoy, and Tim Tebow. Two Texas Tech teammates, quarterback Graham Harrell and wide receiver Michael Crabtree, went 4-5 in the voting. Greene was the top running back in the nation yet had to settle for sixth in the Heisman Trophy voting. It was just the fourth time in the long history of the award that no running back/halfback finished in the top five of the voting (also occurring in 1964, 1991, and 2001). 2008 was definitely a bad year for Greene to be a great running back. So there you are! All ten of Iowa’s Heisman Trophy finalists over the years…and great players all!